Maximize the fun and eliminate weather cancellations at your rodeos with a ClearSpan rodeo arena. ClearSpan arenas create an environment that is ideal for riders and spectators, and the wide open space features no indoor support columns, ensuring plenty of space and unobstructed views. A ClearSpan rodeo arena has the ability to be relocated quickly, making it particularly appealing to traveling or seasonal shows, and our structures can be customized to even the most specific need or layout. Whether you need a building for amateur or professional rodeos, ClearSpan can customize your perfect arena, and their multipurpose nature makes them a great choice for fairgrounds. One issue the Vores had with their facility was that there was no indoor riding space to keep the horses in shape during inclement weather. Said Brandon, “Our family was driving almost forty miles per day to a small, dark, dusty indoor arena.” They needed an arena of their own and turned to ClearSpan Fabric Structures for a solution. 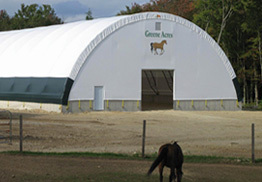 After competing in a similar structure, the Vores decided to look into fabric structures for their equestrian center. For more on Isinglass Equestrian Center and their ClearSpan arena, contact Brandon Vore at bvore@canterburyprepschool.com. 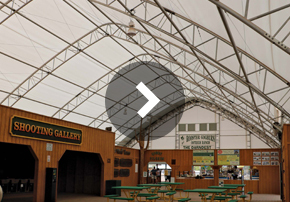 Our rodeo arenas come in fabric, hybrid and metal buildings, ensuring that no matter how you plan on using your ClearSpan structure, there is an ideal option. BUILD YOUR OWN – LOOKING FOR A CUSTOM SOLUTION? Get the latest news, offers and promotions from ClearSpan. © ClearSpan Fabric Structures, Inc. All rights reserved.